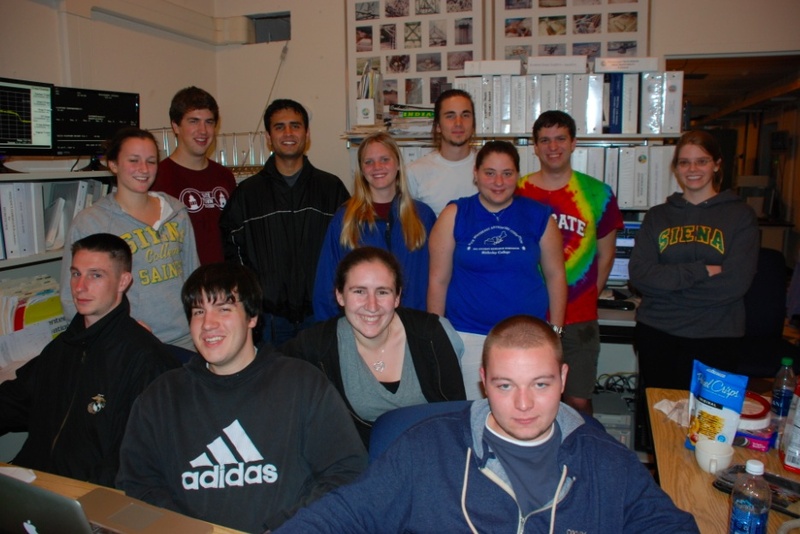 This posting is by Lauren Bearden and the Colgate UAT who spent Thanksgiving conducting the A2010 observing on site at the Arecibo Observatory. After a long night of trying to finish up our schoolwork before the break, we met at Colgate’s Hall of Presidents, bags packed, and ready to go. The ride to Syracuse airport was snug in Katie’s minivan, but went smoothly, and before we knew it we were on the plane headed to JFK airport. Once we got to JFK, we had a delicious multi-ethnic lunch of donuts, lo mein, pad thai, pizza, and Stromboli. Once we got to Puerto Rico, we got picked up by a “Taxi Turistico” and went grocery shopping, buying anything we could find that didn’t require microwavable cooking or complicated preparations. This turned out to be just about soup, chips, bread, cold cuts, cereal, and juice. After arriving in the town of Arecibo, we stopped for dinner at Martin’s Barbecue and got some local food: rice, beans, chicken, and pork. We finally made it to the observatory around 9:30 local time (that’s Atlantic Standard Time, AST = UT-4). We got settled into our rooms in the North VSQ (Visiting Science Quarters), and immediately set off to look around. After a leisurely ten minute walk to the control room, we met students from Siena College who told us a little about what they were doing (and what we would be doing) [see their earlier blog]. We went down to the road that circles the dish to look around, but couldn’t see much because it was so dark. Oh, how we can’t wait until daylight tomorrow to really appreciate the immense size of the telescope. Then, we went back to our rooms, and immediately fell asleep after a long day of travel. Co-QUI! We met up around 10:00 and went on a tour of the platform and dome of the telescope, given by engineer (and pro tour guide) Dana Whitlow. We spent about two and a half hours looking around, asking questions, and learning how a radio telescope actually works from Dana. At first, we were a bit intimidated by the elevation of the catwalk, especially when it was slanted halfway through, but we eventually learned not to let the height get to us, and ended up learning so much. We took tons of pictures… in fact Professor Balonek managed to take over 2,000. We then got some lunch and after a short rest, went back up the hill to look around the visitor center. We were sad that the gift store was closed, but the stations at the museum were interesting and we took many more pictures. Later, we talked to telescope operator Israel Cabrera for a pretty long time in the control room. He told us some great stories of his experiences at the Observatory. He told us about the different people he’s met by working here, how much he’s learned from the visitors, and about his own personal astronomical technology that he keeps at his home. Talking over coffee (Puerto Rican coffee, of course) really does have a way of bringing two groups from different backgrounds together; he was so friendly and willing to share his stories, Israel probably could’ve talked to anyone easily. We went up to the computer rooms after that and practiced starting up the telescope control program (CIMA) for tomorrow night. We made our cheat sheets and after a little more practice tomorrow, will be quick and ready to observe for Martha. We’re so excited! 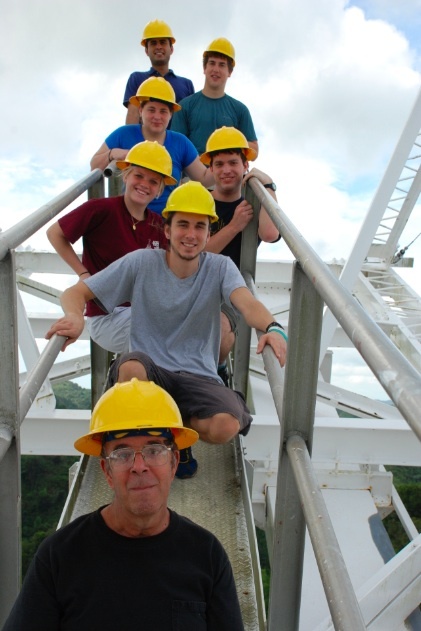 Some shots of the control room can be seen at this link recommended by Israel entitled “hardworking pulsar astronomers at Arecibo” during an observing run by Dan Stinebring and his students from Carleton College. Happy Thanksgiving! 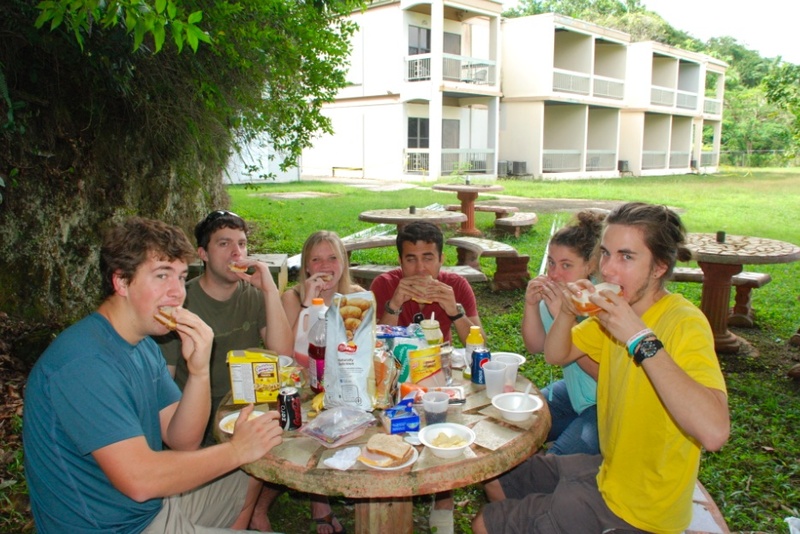 Though not with our immediate families, the Colgate community was sure to have our own feast here on the picnic tables behind our rooms at Arecibo with our “observing family” as Mike called it. We had a great lunch of Turkey sandwiches, Lays and Tostitos chips, guava and cranberry juice, and pumpkin and apple pie. It was, by far, the most unique Thanksgiving I’ve ever had, with minimal preparation and no football game in the background. We then went up to the control room and continued working on perfecting the start up process of observing. We finally got control of the telescope around 6 pm, and after a successful start up by Danny, we got into the rhythm of recording the observations. Observing was fun, especially because looking at and identifying the spectral lines was new to a lot of us. While observing, we noticed the spike in our spectrum from the FAA radar network and the corresponding harmonic frequency from San Juan. We also saw a major signal from galactic HI. Professor Balonek was sure to point out quasars (continuum sources) every once in awhile, also. We learned how to save and transfer the data after observations. We knew that Martha would be checking our results early the next morning. The gift shop was finally open today! We got pina coladas at the stand on the way up the steep hill, hotdogs, ice cream, and lots of presents for people at home. We eventually went up to the Observatory, worked for a while, and then started observing. Awhile after Katie’s successful start up, Danny noticed a galaxy in the spectra! After looking online based on the RA and dec, we identified it as NGS 925! So naturally, we did a celebratory dance. We realized just how much data we were taking, and also how much the survey as a whole would gather total… 56000 data points are taken per second in ten minute scans (with 1 second between scans to calibrate), 6 hours or so of scanning per night, and 4 nights of scanning. But that’s just our data! The survey has been going like this for 6 years! That’s about 3,000,000,000,000 data points! It’s so amazing to be part of such of an important and broad study. We woke up at the crack of dawn (which equates to 11 am for astronomers) and decided it was a great day to explore the surrounding area. We began this endeavor by going way down under the dish, and going up to the towers onsite. We were amazed at how the dish was held into place in its spherical shape by primarily just the tie-downs. The towers were enormous and we enjoyed the hike up and down the hills, though we came back sweating and ready to collapse. WE HAD BETTER THINGS TO DO THAN COLLAPSE, THOUGH! We ventured out into the town of Arecibo in search of some more groceries. On the way, we happened upon a local restaurant, where the food was delicious, but didn’t sit very well in our stomachs. We went straight up to the control room after we returned and began work. We had a successful start up by Kevin, and continued our research throughout the night. At this point, we pretty much know how to handle the computer and know what to look out for in the spectrum on the control screen of the data we’ve taken. One thing that we realized tonight is that the red error messages that have come up the past 2 nights have always happened at 00:00:00 UT time. Because the message never actually affects the images, and it happens at the exact same time every night, we think this might be an error in the computer system, rather than an error with the machinery, and therefore is not something for us to worry about too much. Another successful night complete! Coqui, coqui. Tomorrow we head back to Colgate. While we’re all happy to go back to school (though dreading final papers and exams coming up), we’ll most certainly always remember the time we spent here in Puerto Rico, learning all we can about radio astronomy. WE HOPE TO BE BACK AGAIN SOON! Observing at Arecibo: More impressive than remote observing! This posting is by Martha Haynes, thanks to the UAT at Siena College. While most of the observing for ALFALFA is conducted remotely, it is a lot more impressive to do the observing from the Arecibo control room. For one thing, you can’t really appreciate just how big the Arecibo antenna is until you walk around and underneath it and take a trip up to the platform. Even at night, you can see the lights of the towers and the platform from the control room, and so you get a better sense of just how immense and complex the whole telescope system is. You also get to interact with the telescope operator, hear the sounds of the motors (and the coquis) and watch even more monitors. 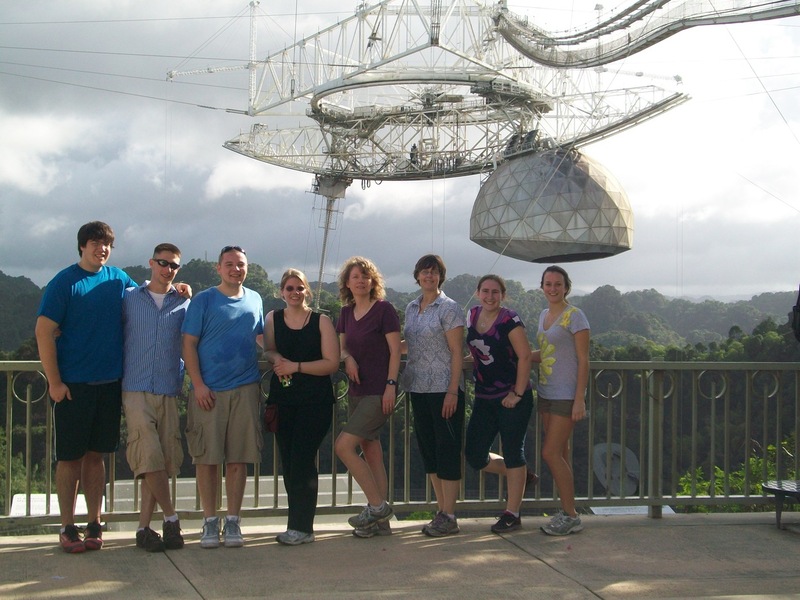 Fortunately, members of the Undergraduate ALFALFA team do get to travel to Arecibo to experience for themselves the awesome site of the “Big Dish in the Jungle”. The ALFALFA observations on Nov 21-22, 2011 were conducted on site by 6 students and 2 faculty members from Siena College. The students were Laura Apicello and Amy McCann (junior physics majors), Alissa Earle and Thad Savery (junior Physics and Math majors) and Ian Gilchrest and Steve Atkinson (senior physics majors). The faculty were Rose Finn and Michele McColgan; it was Michele’s first trip to Arecibo too. The students were all enrolled in an observational astronomy class Physics 380 and had learned about and conducted remote observations for ALFALFA prior to travelling to Arecibo. They arrived in Puerto Rico on Sun Nov 20th. While at the Observatory, they stayed in the VSQ “family units” at the top of one of the hills on site. These units have three beds, one bathroom, a living room, and a kitchen. What were you first impressions when you arrived in Puerto Rico? What are your impressions of the Arecibo telescope? What are your impressions of the Observatory overall? What are your impressions of the observing for ALFALFA? Is it what you expected? What is the most interesting or surprising thing that you have learned while you’ve been on this trip? The chance to visit and conduct observing on site really does make bring the Arecibo telescope and Observatory into perspective! 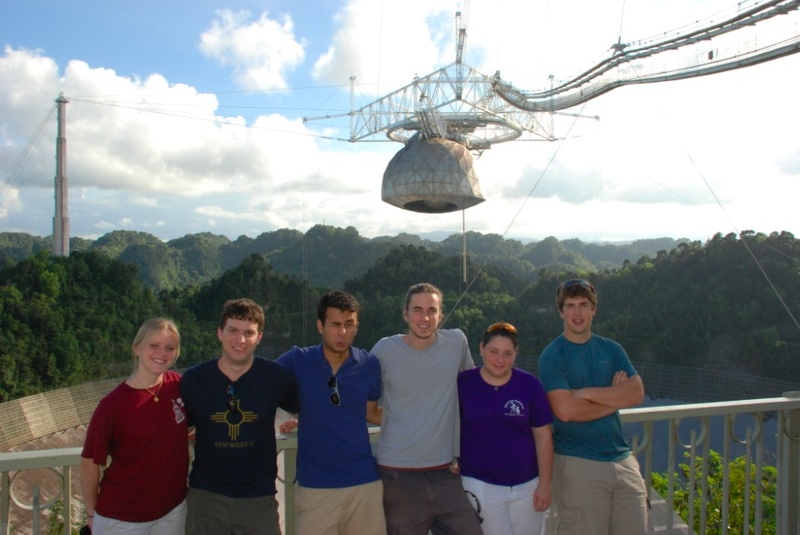 Members of the Undergraduate ALFALFA team are grateful to the National Science Foundation and their respective institutions for the funding support which makes possible these observing trips and to the Arecibo Observatory staff for their assistance and hospitality. Thanks especially to Dana Whitlow for the platform tour!